Premium Banding Tapes are color coded to match EZ Pipe Markers, EZ Arrows and Premium Arrow Banding Tapes. Tapes are liner mounted and rolls are 30 yards long. Made with durable, outdoor-grade vinyl and aggressive acrylic adhesive. 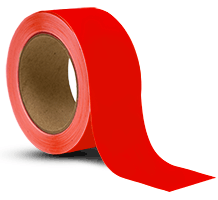 Apply tape to clean and dry surfaces. Premium Exact match banding Tape is made from the exact vinyl as Brimar's EZ Pipe Markers to provide and exact color match. Additional savings / discount will be applied in the shopping cart based on the total number of Premium Banding Tape ordered.